Lenovo B50-80 80EW02ABUS – The Lenovo B50-80 series is the best value for money notebook for your day-to-day business needs. What makes the B50 notebook such a great PC is that it’s surprisingly affordable and available in wide range of configurations and screen sizes. Featuring the latest Intel processors, up to full HD display, DVD drive, SSHD storage and more, the Lenovo B50 is not just perfect – it’s perfect for you. The machine is great choice for who are looking high performance laptop for business or general use and offers built high quality, premium feel and ultimate performance at affordable price, gives you enjoy to use everyday and everytime, and excellent for your business. Thinner than 1″ and weight only 5.1 lbs, makes it easy to carry around office and on the road. Enjoy premium audio experience, the laptop come with integrated stereo speakers with Dolby Advanced Audio v2 delivers crystal-clear audio, immersive surround sound experience when listening musics, watching videos and playing game. Ultra fast for connectivity with built-in high speed wireless 801.11/AC is a latest wireless technology, up to 3x faster than previous generation and provides high speed to access web contents, online games and online chats. Enjoy to work or play longer up to 5.5 hours battery life witout recharging with 4 Cell 32 Watt Hour Li-Cylindrical. Great performance the Lenovo B50-80 80EW02ABUS powered by 5th Generation Intel Core i7-5500U is a power efficient dual-core processor for laptops or ultrabooks based on Broadwell architecture, which has been luanched Q1 2015 features 4MB speed 2.4GHz up to 3.0GHz via Intel turbo boost technology with 8GB memory delivers ultimate performance, long battery life and sufficient power for handle multiple programs, multitasking, entertainment, modern games, hard workloads and responsive smooth for everything to do. Hybrid storage with 1TB SATA hard drive has plenty of space for storing all your files with 8GB solid state hybrid drive to offers high speed read/write files, fast startup windows and quick to access for all your data. Enjoy amazing resolution display, equipped with 15.6-inch Full HD LED AntiGlare display delivers crisp visuals, vivid display in 16:9 aspect ratio and format in 1920×1080 resolution great for watch hd movies, videos and view photos. 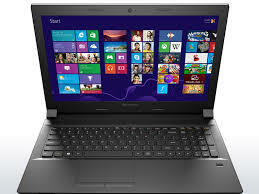 Enjoy more for playing game or multimedia purpose with outstanding graphics performance and image quality – optimized for today, Lenovo B50-80 80EW02ABUS equipped with AMD Radeon R5 M330 dedicated graphics for laptop feature 2GB dedicated memory up to 1030 MHz engine clock and support DirectX 12, Mantle, OpenGL 4.3, OpenCL 1.2, Vulkan. The GPU improve performance over integrated graphics so you can work faster and play harder with games that run smoother and look better. Dedicated graphics memory enhances laptop performance for games and multimedia, while advanced power management technology conserves power to keep you running when you are on the go. An HDMI port for output high quality details to HDTV or other screen, enjoy high quality video and audio. The laptop has premium other features with DVD Recordable, audio combo jack, 4-in-1 card reader support (SD/MMC/SDHC/SDXC) give you can share or store your files, Bluetooth Version 4.0, USB 2.0 port for connect to other usb devices and 2x USB 3.0 fast transfer large data or movies, up to 10 times faster than previous USB technologies, Built-in HD webcam and integrated microphone, and the Lenovo B50-80 80EW02ABUS powered by Microsoft Windows 7 Professional 64 preinstalled through downgrade rights in Windows 8.1 Pro 64.